[155 Pages Report] The overall text analytics market is expected to grow from USD 3.17 billion in 2016 to USD 8.79 billion by 2022, at a CAGR of 17.2% from 2017 to 2022. Text analytics is a tool that applies sets of statistical, linguistic, and machine learning techniques, to analyze the text data gathered from social and enterprise sources. Text analytics extracts useful information from social, online, or enterprise data, in order to create valuable insights for business, research, and investigation. The software solutions are increasing in demand among business groups to automate the identification of entities, topics, events, concepts, and personal attributes, and streamline the decision-making and business optimization process. The base year considered for the study is 2016, and the forecast has been provided for the period between 2017 and 2022. The healthcare segment comprises organizations involved in providing medical services, pharmaceutical companies, medical equipment manufacturers, and medical transaction processing organizations. With the growing importance of data analysis in the healthcare vertical across the world, the utilization of text analytics is also increasing. This vertical generates significant volumes of data, comprising clinical, administrative, and financial data on a regular basis. Collecting massive amounts of patient data is not useful, unless that data can be quickly analyzed to make decisions that improve both the quality of care and financial outcomes of the organization. The aggregated patient data can be used to identify illnesses, improve patient safety by controlling the medications being provided to them, and enable efficient and cost-effective checks on the physician’s activities. The growth of text analytics in the healthcare industry vertical is tremendous and vendors, such as Averbis and SAS Institute, Inc. are coming up with improved solutions to integrate the semantic speech recognition in medicine. The healthcare industry vertical also comprises life sciences that uses text analytics to monitor, maintain, and analyze data. During this research study, major players operating in the text analytics market in various regions have been identified, and their offerings, regional presence, and distribution channels have been analyzed through in-depth discussions. Top-down and bottom-up approaches have been used to determine the overall market size. Sizes of the other individual markets have been estimated using the percentage splits obtained through secondary sources such as Hoovers, Bloomberg BusinessWeek, and Factiva, along with primary respondents. The entire procedure includes the study of the annual and financial reports of the top market players and extensive interviews with industry experts such as CEOs, VPs, directors, and marketing executives for key insights (both qualitative and quantitative) pertaining to the market. The figure below shows the breakdown of the primaries on the basis of the company type, designation, and region considered during the research study. The text analytics ecosystem comprises vendors such as SAP SE (Germany), IBM Corporation (US), SAS Institute, Inc. (US), OpenText Corporation (Canada), Clarabridge, Inc. (US), Megaputer Intelligence, Inc. (US), Luminoso Technologies, Inc. (US), MeaningCloud LLC (US), KNIME.com AG (Switzerland), Infegy, Inc. (US), Lexalytics, Inc. (US), Averbis (Germany), and Bitext Innovations S.L.(Spain). These Text Analytics Software Vendors are rated and listed by us on the basis of product quality, reliability, and their business strategy. Please visit 360Quadrants to see the vendor listing of Text Analytics Software. In November 2016, SAP launched SAP HANA 2, which makes use of the in-memory technology to perform text analytics. This provides text mining and the discovery of new insights from structured and unstructured data using a single platform to gain contextual insights. In August 2016, SAS entered into an agreement with Teradata Corp., making Teradata a global authorized reseller of SAS data management and analytics software. The agreement allowed the companies to identify, design, and source a portfolio of SAS’ analytics, data management, Hadoop, in-database, and in-memory solutions marketed by Teradata. This helped increase SAS’ client base. In July 2016, OpenText acquired Recommind, Inc., a provider of eDiscovery and information analytics. Through the acquisition, OpenText customers benefited from Recommind’s analytics solutions for eDiscovery, investigations, contract analysis, and information governance including Decisiv Search, Perceptiv, and Axcelerate. The overall text analytics market is expected to grow from USD 3.97 billion in 2017 to USD 8.79 billion by 2022, at a CAGR of 17.2% from 2017 to 2022. Factors such as the emergence of multilingual text analytics to break the language barrier and increase in industry-specific text analytics applications are driving the global market. Text analytics is a tool that applies sets of statistical, linguistic, and machine learning techniques, to analyze the text data gathered from social and enterprise sources. Text analytics extracts useful information from social, online, or enterprise data, in order to create valuable insights for business, research, and investigation. The text analytics software solutions are increasing in demand among business groups to automate the identification of entities, topics, events, concepts, and personal attributes, and streamline the decision-making and business optimization process. Nowadays, text analytics has been finding greatest use in CEM and marketing management, risk management, and fraud detection applications. Text analytics has evolved from word extraction and document categorization to sentiment analysis, along with today’s predictive analysis for CEM, market research, investigative analysis, and social listening. It uses Natural Language Processing (NLP) to structure the unstructured data and categorize it. For instance, NLP helps merge the unstructured text-based data with operational data in Voice-of-Customer (VoC) programs. 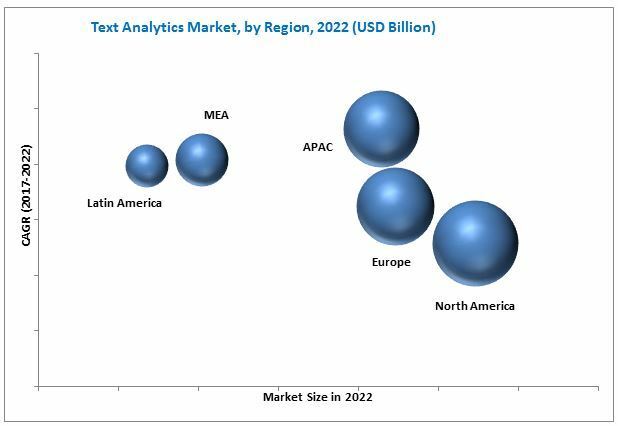 The text analytics market has been segmented, on the basis of component, application, deployment model, organization size, industry vertical, and region. The demand for software is rising on account of growing prevalence of social media content toward improving customer experience and building effective marketing campaigns. Among applications, customer experience management is expected to continue its dominance during the forecast period. The use of text analytics solutions is increasing among businesses to gain better insights into customer demands and product feedbacks and offer better services. The cloud deployment model is expected to exhibit a higher adoption, compared to the on-premises deployment model. The demand for cloud-driven Application Programming Interfaces (APIs) is rising among customers, which in turn is supporting the growth of cloud-based deployment models. The retail and eCommerce segment, followed by the Banking, Financial Services, and Insurance (BFSI) segment, is expected to constitute the largest market share and continue to lead the market during the forecast period. In 2017, North America is expected to dominate the text analytics market with largest market size. This trend is expected to continue throughout the forecast period. The market is revealing a strong positive trend in this region owing to the easy availability of text analytics solutions. Various companies and industries are adopting text analytics software and services to create business models that support real-time decision making and improve productivity. The APAC region is expected to exhibit the highest growth rate. This growth can be attributed to growing awareness, surge in data, and increasing demand for real-time analytics. Organizations in the eCommerce arena get to collect tremendous customer data, with constant additions every day. The data is collected through social media in the form of comments, posts, or blogs, which prove to be helpful in demand forecasting, customer segmentation, and profitability analysis. The retail and eCommerce industry has shown a significant adoption rate of text analytics solutions. 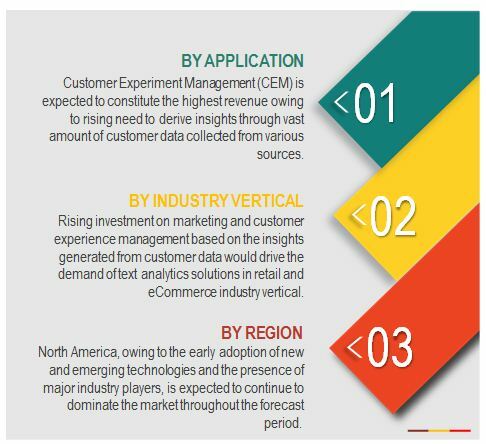 Text analytics applications in the retail and eCommerce vertical are majorly focused on marketing and CEM, which include analysis of brand reputation, purchase behavior, summarization of surveys and reviews, churn analysis, and developing selling and promotion strategies. Text analytics has various applications in the BFSI vertical, which include forecasting, fraud detection, and CEM. By leveraging the customer data analysis, text analytics solutions assist organizations to establish a long-term relationship with their customers. Furthermore, text analytics helps in better tracking the insurance claim pattern and monitoring fraudulent activities, and also in carrying out risk assessments. The BFSI industry vertical is prone to risks and frauds, and is constantly searching for a new solution to mitigate frauds in securing financial transactions for the customers. With the growing importance of data analysis in the healthcare vertical across the world, the utilization of text analytics is also increasing The aggregated patient data can be used to identify illnesses, improve patient safety by controlling the medications being provided to them, and enable efficient and cost-effective checks on the physician’s activities. The growth of text analytics in the healthcare industry vertical is tremendous and vendors, such as Averbis and SAS Institute, Inc. are coming up with improved solutions to integrate the semantic speech recognition in medicine. The healthcare industry vertical also comprises life sciences that uses text analytics to monitor, maintain, and analyze data. With text analytics, marketers can analyze customer data and predict the needs of the audience. Applications and mobile websites offering news, images, articles, and audio and video content, either self-branded or sourced from providers and publishers are the key segments of this industry vertical. By incorporating text analytics solutions, the historical data can be culled from relevant concepts, entities, sentiments, and relationships, to produce a rich tagging system and these entities can be kept as metadata about the articles and used when needed. This helps organizations in the media industry to improve the user engagement and increase the potential for generating advertising revenues. What are the upcoming industry applications for text analytics? Creating awareness among the end-users on how text analytics can turn large chunks of data into valuable information is directly responsible for increasing the overall adoption of text analytics. Limited text analytics software vendors have their presence in the market, offering text analytics solutions to analyze big data due to its complexities. With the advancement in technologies, software nowadays offers big data analytics and allows real-time analysis with a user-friendly interface. Text-based content still constitutes to a major chunk of information available within as well as outside the organizational boundaries. Text analytics, combined with big data, would assist organizations to analyze the vital information essential to an organization’s decision-making abilities, which may have remained unexplored until now. The text analytics ecosystem comprises vendors such as SAP SE (Germany), IBM Corporation (US), SAS Institute, Inc. (US), OpenText Corporation (Canada), Clarabridge, Inc. (US), Megaputer Intelligence, Inc. (US), Luminoso Technologies, Inc. (US), MeaningCloud LLC (US), KNIME.com AG (Switzerland), Infegy, Inc. (US), Lexalytics, Inc. (US), Averbis (Germany), and Bitext Innovations S.L. (Spain).